2015 I WRAPS I 49 Too Many Graphics One poor choice that is often requested of the designer is to have an over- abundance of "graphics" within the wrap design. 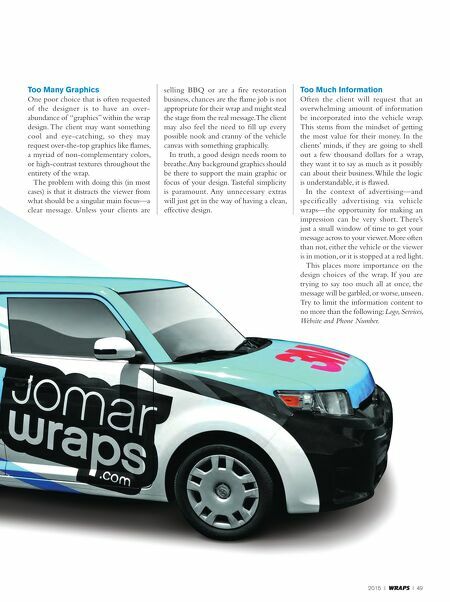 The client may want something cool and eye-catching, so they may request over-the-top graphics like flames, a myriad of non-complementary colors, or high-contrast textures throughout the entirety of the wrap. The problem with doing this (in most cases) is that it distracts the viewer from what should be a singular main focus—a clear message. Unless your clients are selling BBQ or are a fire restoration business, chances are the flame job is not appropriate for their wrap and might steal the stage from the real message. The client may also feel the need to fill up every possible nook and cranny of the vehicle canvas with something graphically. In truth, a good design needs room to breathe. Any background graphics should be there to support the main graphic or focus of your design. Tasteful simplicity is paramount. Any unnecessary extras will just get in the way of having a clean, effective design. 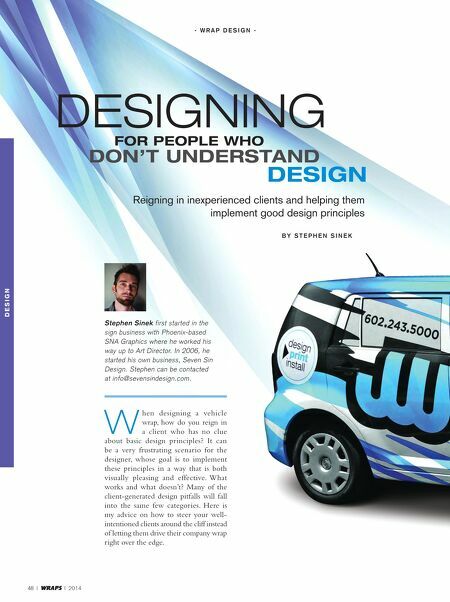 Too Much Information Often the client will request that an overwhelming amount of information be incorporated into the vehicle wrap. This stems from the mindset of getting the most value for their money. In the clients' minds, if they are going to shell out a few thousand dollars for a wrap, they want it to say as much as it possibly can about their business. While the logic is understandable, it is flawed. In the context of advertising—and specifically advertising via vehicle wraps—the opportunity for making an impression can be very short. There's just a small window of time to get your message across to your viewer. More often than not, either the vehicle or the viewer is in motion, or it is stopped at a red light. This places more importance on the design choices of the wrap. If you are trying to say too much all at once, the message will be garbled, or worse, unseen. Try to limit the information content to no more than the following: Logo, Services, Website and Phone Number.